Esco is committed to compliance with international standards for product performance, safety and energy efficiency. Certifications and recommended practices apply to products, manufacturing processes and administrative documentation including biological safety cabinets, fume hoods, air quality, electrical safety and more. These are critical to our business model and to our relationships with customers, distributors and certifying agencies. Certification pathways are managed in-house, supervised in-house by thirdparty accreditors, or outsourced to independent certification agencies. Certification, compliance, recommended practices and agency listings represent a significant investment on behalf of our valued customers. In 2006, following an on-site assessment under the Underwriters' Laboratories (UL) Witness Test Data Program, the Esco Electrical Testing and Research Laboratory Facility in Singapore was certified to perform tests under the following standards: UL 61010A-1, UL 61010-1 and CAN/CSA C22.2 no 61010-1. The 61010-1 family of standards covers electrical safety requirements for laboratory and control equipment in North America, Europe and Asia. This accreditation certifies that Esco facilities, equipment and personnel needed to move towards "self-certification" will accelerate new products to market, strengthen internal capabilities and enable Esco to build better and safer products for our global customers. Esco is the only biological safety cabinet manufacturer in the world to gain UL accreditation. This investment reinforces our commitment to excellence and product engineering assures our customers that we have the best equipped research & development team in the world developing the safest laboratory equipment possible. Because testing and certification are integral to our product lines, Esco has invested in in-house testing facilities staffed by full-time microbiologists and NSF field certifiers. These facilities are configured to accommodate independent testing agents and third-party certifiers who visit Singapore regularly to perform compliance audits and to assist our research team in pre-certification of new products before they are submitted for formal certification. Our testing facilities include a controlled environment walk-in room to create temperature and relative humidity ambients, a wind tunnel, a microbiological laboratory with associated cell culture and bacteriological analysis systems, and networked computer systems for fluid dynamic modeling and interpretation, data acquisition, management and archiving. Esco performs testing in accordance with more than 10 of the world's most recognized standards for local, regional and international criteria. Testing in our microbiology laboratory is conducted according to NSF49:2002, EN12469:2000, and JIS K3800:2005 to determine product performance and efficacy related to protection of personnel, product and cross contamination within the work area when using potentially hazardous samples. NSF-accredited biohazard cabinet field certifiers are available in-house full-time to supervise all testing work, using harmless Bacillus atrophaeus (formerly Bacillus Subtilis) to challenge the cabinet. These samples are then incubated for 48 hours before Colony Forming Units (CFUs) are counted to determine the testing results. To establish real-world conditions, we increase microbiological challenge tests to include placing objects inside the cabinet work zone, use of a Bunsen burner, external airflow disturbances from the laboratory, and Human-As-Mannequin tests adapted from Fume Hood development. 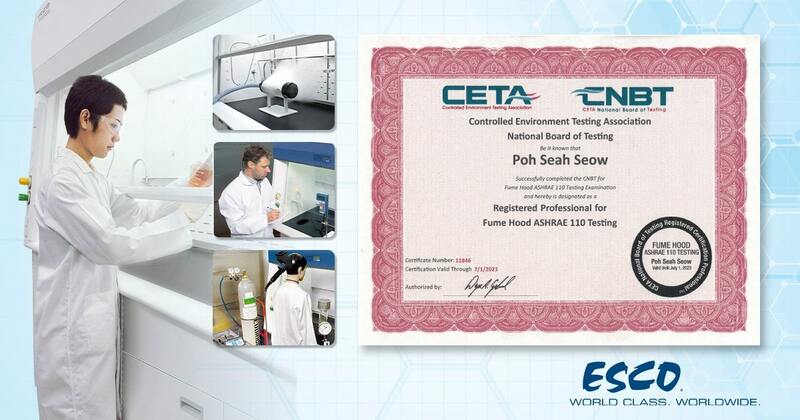 For fume hoods and other products Esco uses primary and supplemental testing protocols such as ASHRAE 110 containment and activated carbon adsorption testing to evaluate, document and ultimately improve product performance in all phases of manufacturing, transit, installation and operation.